The Ideal choice for families or friends is our spacious two bedroom apartment. 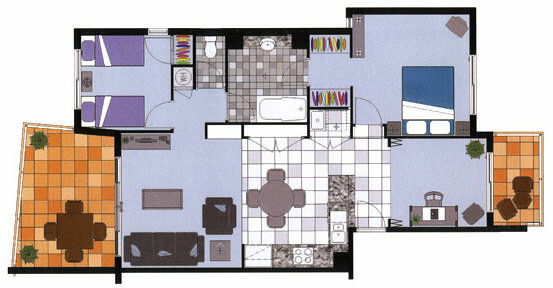 All two bedroom apartments are self-contained. Featuring two bedrooms with one queen and two single beds. As well as an extra room which can be used to sleep additional guests with the use of the sofa bed (cost applies). Each apartment is individually owned and styled with a beach-side theme throughout. The one level apartment offers a two bathroom, open plan dining and living area, full laundry facilities and a streamlined kitchen. Having all of these great features really makes this apartment your home away from home. 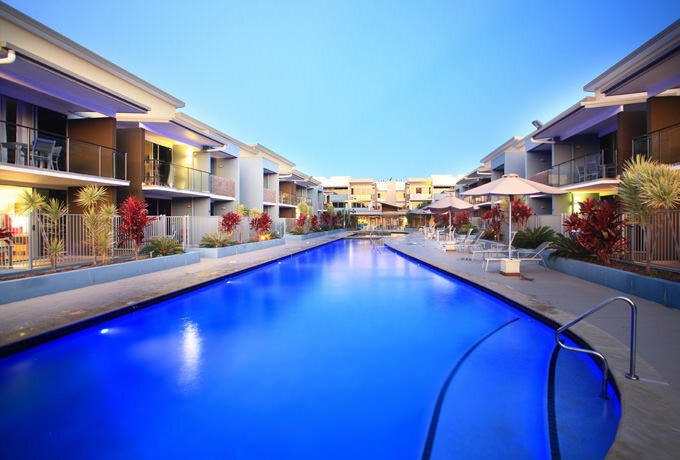 Every apartment has its own balcony/courtyard with views of either the landscaped gardens or the amazing pool area. There is also a smaller balcony / courtyard off of the study where you will find a clotheshorse. As well as an allocated undercover car park, located within close proximity to the apartment. All linen is provided during your stay. As well as a small starter kit of basic supplies for your convenience. However, services and extra amenities can be arranged with the front office for a small fee per service. The apartments serviced mid week for bookings 7 nights and over.